George Graham Reviews Beat Circus' "Boy from Black Mountain"
While there's still a lot of territory left to explore musically in rock and pop, a proliferation of different styles and influences has made for eclecticism that has more or less fed on itself -- artists drawing wider circles for their influences and mixing seemingly disparate styles, and then using those mixtures as a base for further stylistic conglomeration. This time, we have another good example of eclecticism writ large. It's the new recording by the band Beat Circus, a CD called Boy from Black Mountain, which they themselves have called "weird American Gothic." Beat Circus draw mainly on early 20th century influences, with instrumentation like violin, accordion and brass including trombone and tuba, and also electric guitar that's sometimes cranked up pretty hard. Their lyrics can also draw on old-fashioned elements, like crime and fugitives. They come up creating an engaging if somewhat unsettling musical atmosphere. Beat Circus are hardly the first band to draw on very-pre-rock influences. Tom Waits has been doing some music along similar lines for a quarter century now, and more recently, there have been groups like the Asylum Street Spankers, Devotchka and the Born Again Floozies mixing in old-fashioned instrumentation with their original music. Beat Circus are perhaps a bit more serious musically and lyrically, and the musical quirkiness is in the service of the songs. Beat Circus is currently an eight member group based in Boston. But it's mainly an outlet for the creative work of Brian Carpenter, who wrote all the material, and is the only person in common in various incarnations of the group on their previous two albums. Carpenter's family is from the Deep South -- in the Florida Panhandle, and he draws on some of the Southern literary milieu, William Faulker, Flannery O'Connor for inspiration, along with stories from his family. 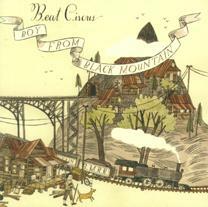 Carpenter describes Boy from Black Mountain as the second part of a what he calls his "Weird American Gothic" trilogy, which he started on the band's previous recording Dreamland. Carpenter also notes that he began writing this recording just after his son was diagnosed with autism in 2006, and there are two songs that were inspired by the difficulty that caused his family. The regular instrumentation on this CD, with the current band members, usually encompasses strings, including a violin, a viola and acoustic bass, tuba, trombone, drums, plus electric guitar and sometimes banjo, with Brian Carpenter playing things like accordion, trumpet, harmonium, and sometimes just vocals as the band provides the motley collection of instruments. Boy from Black Mountain, the new third CD from the Boston-based band Beat Circus is an engaging and fun musical trip to curious destinations, with the instrumentation evoking everything from vaudeville to old movie soundtracks to contemporary classical. Brian Carpenter's songs are a fascinating mix, with lyrics that can be as fanciful as the music. Other groups have tried this kind of quirky, old-fashioned-sounding instrumentation with varying degrees of success, but Beat Circus have the imagination to pull it off very well and maintain a kind of aura to the recording. It's great at holding your attention, with very few moments that cross the line from being eclectic to being wacky. Our grade for audio quality gets pushed down to a generous B-minus. While most of the instruments and vocals are reasonably well recorded, and studio effects are minimal, it's unfortunately the same old story of music being murdered by excessive volume compression. The mastering engineer seemed to be trying to win a loudness war with a heavy metal CD. The ebb and flow of this mostly acoustic, subtly performed music was completely obliterated to make everything maximally loud all the time. On the one hand, the commercial music industry is serving up homogeneous, digitally constructed, electronically pitch-corrected, product completely devoid of imagination or any desire to do sonic experimentation. But fortunately, on the other hand, if you look hard enough you can find music that is as clever, creative, fascinating, and downright amusing as Beat Circus. It's definitely worth seeking out, and reveling in the musical pastiche Brian Carpenter and his colleagues come up with.